The humble bead has been a part of human decoration and self adornment for as much as 100,000 years. The earliest examples, from around the Mediterranean shores of the Near East and North Africa, were made from shell and bone. With the rise of urban civilizations and new technologies beads were developed in new materials. Utilizing examples from our own web stores we will examine several examples from Egypt, Phoenicia, the Roman Empire and beyond, spanning about 1,500 years. 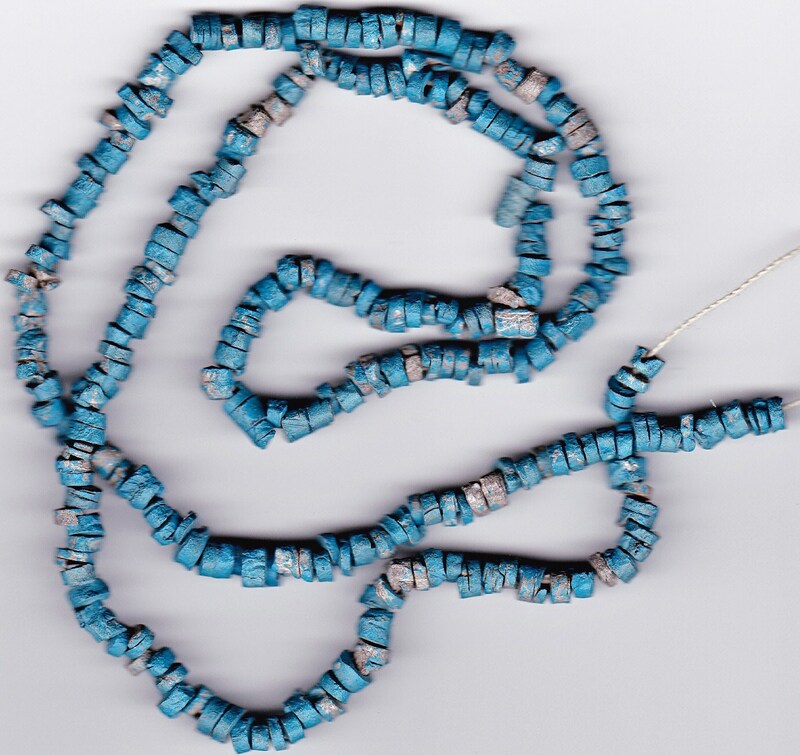 The earliest beads on our website are these Egyptian faience beads, dating to the Third Intermediate Period or Late Dynastic Period, Circa 1,070-332 BCE. 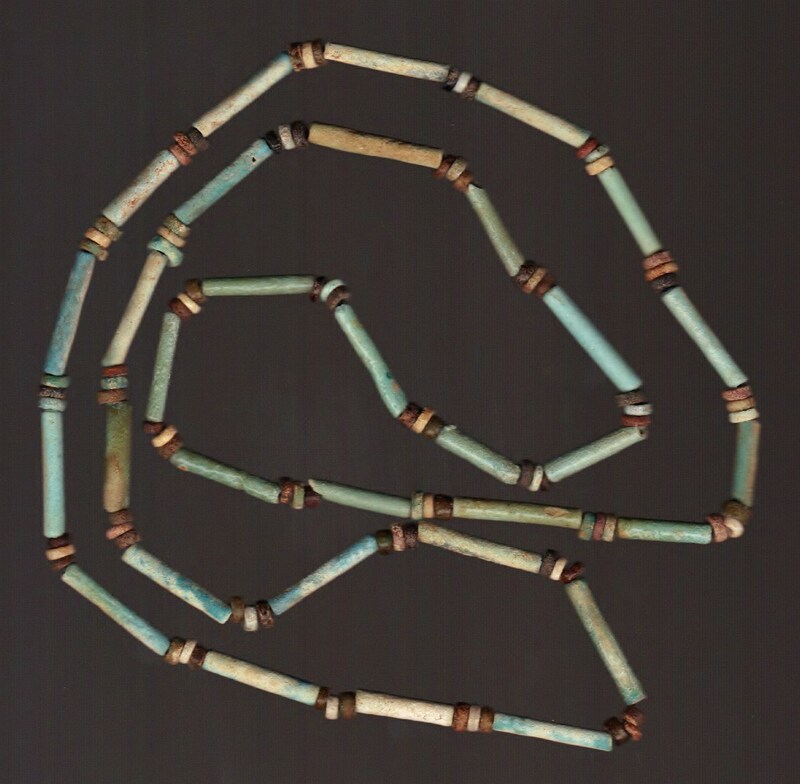 Egyptian faience, combining many of the qualities of both ceramic and glass but made primarily from ground quartz, had been made into beads since the 5th Millennium BC. This beautiful string of densely packed discoid faience beads dates to the Ptolemaic or early Roman period in Egypt. 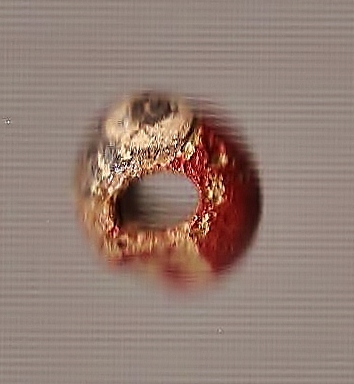 This Phoenician rod-formed glass eye bead, spherical, with a single blue and white “eye” protruding from a brick red matrix, dates to the 6th – 4th Century BCE. Included with several other ancient glass objects, this is the oldest glass bead on our website. Eye beads, thought useful in keeping away evil, have a long history from the late 2nd Millennium BC through the modern era. Like most ancient Roman and later glass beads, this Roman mosaic glass bead of the 1st or 2nd Century AD was made by “rod forming”; that is, by forming the bead at the end of a metal rod, thus creating the central hole for stringing, and working the object in the flame. This object may well have been made at Alexandria in Egypt, the greatest center for glass working in the early Roman period. This lovely group of Roman crumb beads was made by rolling a hot glass bead of very dark color over a heated stone or metal surface with small chips of red, yellow, blue and green glass scattered on it. The hot glass bead picked up the chips and the object was repeatedly heated and rolled on the surface again until the chips were basically flush with the bead. Roman bead makers, like others before them, often made beads in the form of pendants. 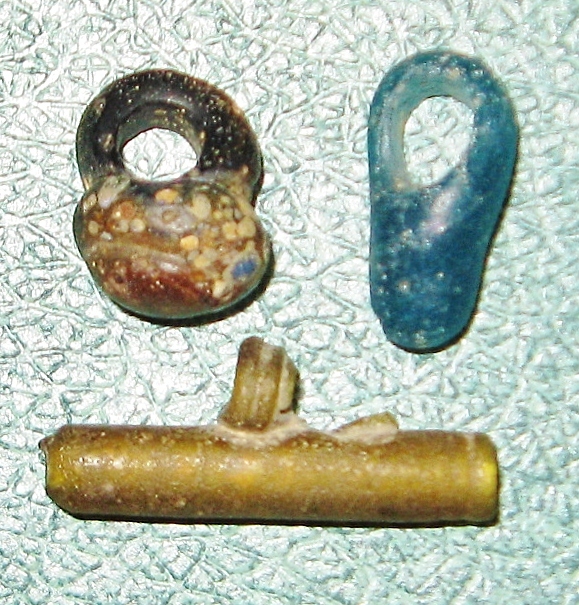 This group of 3 beads in a variety of shapes and colors, one of which is also a modified crumb bead, is a good example. 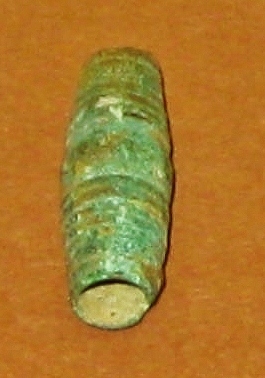 Not all Roman beads were glass. Beads were just as often made from humble materials, including stone (common, semi-precious or precious), shell, bone or metal. 3 of the 4 beads in the group above are made from stone. 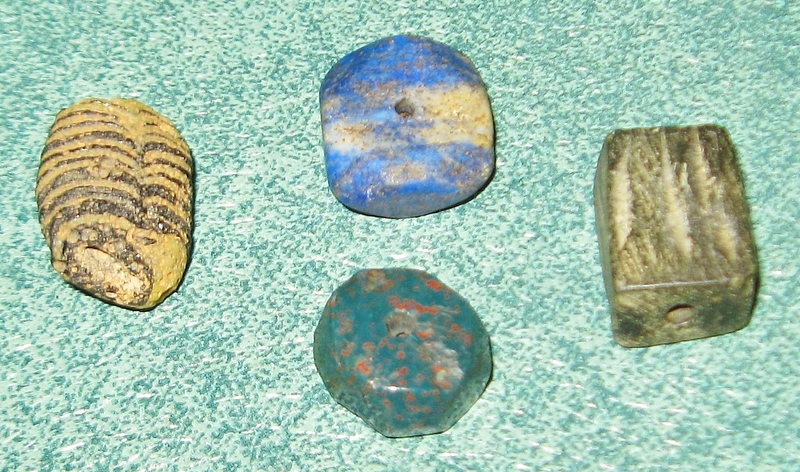 One, with simple striations for design, is of soapstone, one of lapis lazuli and another of what appears to be malachite. This large bronze bead, part of a group of 3 Roman bronze Jewelry elements offered together on our website at is a good example of pre-Roman practices of bronze jewelry making continuing into the Roman period. This example comes from Roman Spain, where bronze jewelry elements, such as beads, were common in the Iberian and Iberian-Celtic cultures. After the western Roman Empire had collapsed and slowly morphed into various early Medieval European states, glass making did of course continue. But it was in the east, in the Byzantine Empire, direct descendant of ancient Rome, that glass making, including beads, continued basically uninterrupted and indeed flourished. New forms evolved for new uses. 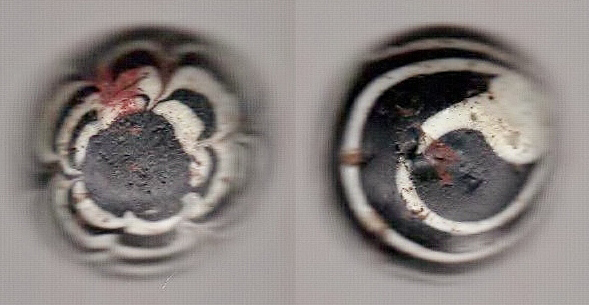 The Byzantine bead illustrated here shows the continuity of form from the previous thousand years of glass bead making but is distinctly Byzantine in decoration. Of course, glass bead making evolved again and continued to flourish in the Islamic period, from the 8th Century AD right up to the mid-20th Century in some specific places. Although the item illustrated here is a Medieval Islamic game piece, it was made by a bead maker and is really no more than a modified bead. Avoid buying from so-called “dealers” on the major web based auction sites (you know who I mean). Deal only with reputable dealers belonging to a major antiquities trade association. Glass beads in particular are notoriously difficult to date. This is because bead making was basically a conservative trade; why change styles much when something works? Styles and even chemical compositions of raw glass remained little changed for long periods of time. In addition, some decorative styles were reinvented or emulated centuries after they had gone out of style. Some dealers are simply lazy and fail to recognize subtleties that can correctly date glass beads. Before buying, ask the dealer to provide comparative data, as we do on our website. Hidden Histories, Exhibition Catalogue. Marwa Helmy, University College London, Petrie Museum of Egyptian Archaeology, 2008. Ancient Glass in the Israel Museum, Beads and Other Small Objects. Israel Museum, Jerusalem, 2001. Thank you for this most interesting post. I love beads and always wear them, a different color for each day. My favorite color is blue. Your pictures showing lots of variety are brilliant.